We’ve said it before. We still mean it. Oil markets are set to get a lot tighter. The focus is now on its international operations. 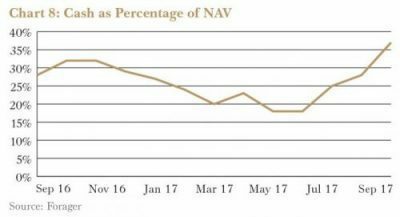 Cash is 37% of NAV. This is not a macro call. A distracting spinout abroad leaves Reckon facing mounting pressures. The global economy might be looking up but investors don’t seem as optimistic. On a recent trip to the UK, Germany and Norway we encountered despondency, worry and cautious optimism respectively. It was my last meeting on the last day of the annual four-day Baader Bank conference, attended by some 170 German, Swiss and Austrian companies. The question seemed fairly innocuous. “Which of the businesses do you think is the best?” You would have thought from his response that the Continental AG investor relations guy had been asked if he had committed murder. He looked around sheepishly, checked the room for listening devices and whispered “the powertrain business”. A powertrain is the collection of componentry that transfers power from an internal combustion engine (“ICE” in the industry lingo) to an automobile’s axels. Continental and another UK parts provider, Delphi, dominate the market for their supply to global automobile manufacturers. It is not hard to see why the IR guy likes this part of the business so much. The reason he didn’t speak out loud is that, at this year’s conference, ICE was a dirty acronym. The new star of the show is “EV”, industry speak for electric vehicle. Unfortunately for Continental, electric vehicles don’t need a powertrain. There was hardly a presentation without a slide or attendee question on “EV Strategy” and its impact. Attendees seemed convinced that the internal combustion engine is going the way of the ice box. Perhaps this is a consequence of the diesel emissions scandals or the sky high market valuation attributed to US electric vehicle manufacturer Tesla. At just 0.4% of 2016 global automobile sales last year, electric vehicles have a long way to go before they are a meaningful part of the world’s automobile fleet. There are many hurdles yet to be overcome. Better range, faster charging and longer battery lives are essential if electric vehicles are to go mainstream. Yet the progress is astonishing. And huge pressure is being applied to listed companies to make sure they aren’t left behind. Trends such as these present a conundrum for value investors. As we have said on many occasions, sometimes a theme or narrative around an industry or trend can take on a life of its own. Market valuations can get well ahead of reality, and company boards can make consequential decisions as a result. It seems fairly obvious that most of those investors caught up in the current lithium mining frenzy are going to lose money. But it is also easy to see, with the benefit of hindsight at least, that those investors who ignored recent trends in media and retail have also lost many fortunes. Another area where giant strides are being made is the provision of renewable energy. In a future quarterly report you will hear more about a new investment with significant exposure to renewable energy. But a recent UK meeting provided some interesting insight into an industry that is rapidly becoming competitive with traditional forms of electricity generation. The UK’s regulatory framework for renewable energy is as much of a hodgepodge as Australia’s. The latest iteration does away with renewable obligation certificates (their equivalent of Australia’s renewable energy certificates) and instead auctions off government support for a fixed amount of renewable energy capacity. Potential renewable energy providers bid a price that they need guaranteed to build new projects, with the lowest bid winning. If the price guaranteed by the government is higher than the market price, the government pays the bidder the difference. If it’s lower, the winner pays the government instead. The most recent auction of offshore wind capacity was won by Dong Energy AS, bidding a price of £57.50 per megawatt hour. That’s a stunningly low number, roughly half the winning bid two years ago. Offshore wind energy, traditionally more expensive than onshore, is not too far from being competitive with traditional sources of energy. Before getting too carried away, it is worth noting that there is no compelling requirement for Dong to do anything. They have bought an option and given the project is next to their existing infrastructure, it probably doesn’t compare to genuine newbuild costs. It is clear that onshore wind projects in the right location are going to be as cheap as coal and gas within the next few years, if not already. That has profound implications for its global adoption and the way we use energy. Again, the sector still has many hurdles to overcome. Its intermittent nature causes most of the problems with renewable energy, but those problems will eventually be solved. Under pressure to shift its focus to electric vehicles, Delphi announced the spinoff of its powertrain business into a separate entity (due to be listed in March next year). Conti’s board has resisted that same investor pressure and decided to keep its powertrain business. Only one of the two can be right. Forced to place a wager, I’d guess the Continental board has it right, but the risks are clearly heightened. Up in Norway, where there are more Tesla’s per head than any other country in the world, investors are getting increasingly confident that oil ain’t dead yet. On this topic at least, the future seems clearer. Gareth Brown and I attended an oil and gas conference in Norway and the mood was decidedly upbeat. The reason is that, after a number of false starts and a longer, deeper downturn than the industry has seen before, the industry is seemingly through the abyss. Global inventories are falling. Demand is very strong. There hasn’t been enough recent investment to replace declining production. You can read more about this later in the International Fund section. The conference organiser, Pareto Securities, showed a chart pointing to an additional 13 million barrels of oil supply per day required to meet declines in existing production (compared with current daily production of 96 million barrels) by 2020. Some of that (4 million barrels) will be met by already sanctioned projects. Some of it by increasing US shale production. But it is blatantly obvious that offshore oil projects are going to be required. Efficiency improvements in recent years might mean the supply can be added at an oil price of US$60 per barrel and that the price doesn’t need to go higher. Maybe so, but they had better start spending soon. In all three industries mentioned above – cars, oil and energy – significant long-term changes are inevitable. From an investor’s perspective, however, predicting the future is not as important as determining a realistic value for it. It helps to dream like Nostradamus, but sometimes the value can be hanging back with the Luddites. At our upcoming webinar in November we’ll have Kevin Rose in town from New York, along with Gareth and myself, talking about the future and where we see value today in the global equity markets we look at. We have had great feedback on our first two webinar efforts this year and this one should be a good one. You can listen, email in questions and watch the slides live on 9 November. Otherwise you can catch it any time after the live event via our YouTube channel, along with the September Quarterly Report videos that should be online by the time you read this. You can register for the webinar here. Global stock markets continued their march higher during the September quarter. That has resulted in further selling across the portfolio. There has been some good news, however, and there is one sector still offering significant value for investors. Four long and mostly painful years. That’s how we feel when reflecting on for Forager’s investments in the oil slick. There have been a couple of successes, one disaster and an inordinate amount of volatility. The glut was supposed to be over by now. In the September 2013 Quarterly Report we wrote that, by 2015, increasing production from US shale oil would be “easily absorbed by an estimated incremental demand of 4 million barrels from non-OECD countries over the same time frame”. While correct on demand, that forecast was about as wide of the mark as you can get. 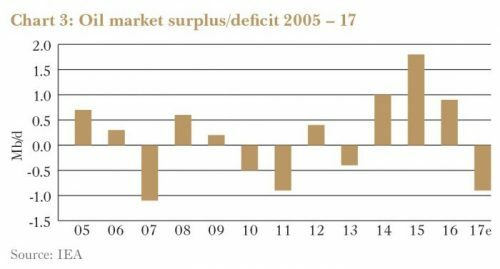 An excess of supply persisted well into 2017. At the risk of looking even stupider, we are maintaining exposure to a higher oil price. This year the surplus has become a deficit. It’s likely that this deficit will widen over the next few years and, unless many billions of dollars are spent soon, the world is facing the prospect of a significant shortage of oil in the early years of the next decade. The dramatic and protracted downturn in the oil price has been posited by many as heralding the end of fossil fuels. That may be a conversation we are having in 10 years’ time, but it is not the cause of this current downturn. Global demand for oil has been consistently ahead of expectations, and the growth seems to be accelerating. There are two explanations. Global economic growth is more robust than it has been for a long time. And a low oil price has encouraged consumers to buy cars that guzzle a lot more fuel. In the first half of the 2017 calendar year, there were 90,302 electric vehicles sold in the US. That is approximately one fifth of the number of Ford F Series sales in the same period (429,860). 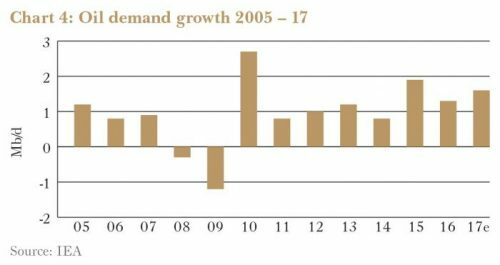 The increase in global demand in 2017 – two million barrels of oil per day – has done more than anything else to rectify the oversupply that existed in the oil market. Combined with cuts in production from the OPEC cartel, surging demand has turned a 2 million barrel per day surplus into a one-million-barrel daily deficit. The glut is already shrinking, and it is going to start shrinking faster. When first investing in the oil space the theory was that there is no cure for low prices like low prices. The market is oversupplied so the oil price falls. 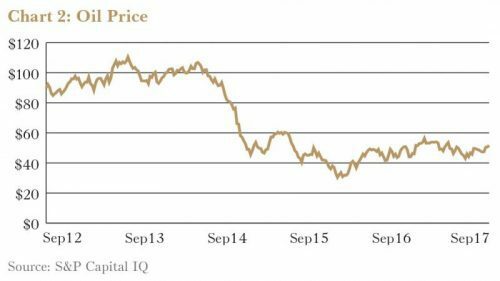 A low oil price means investors don’t spend any money adding new supply. The market goes back into balance and the oil price goes back up. There is nothing wrong with the theory—there is no market where the theory works better. The mistake made was underestimating the time lag between price signals and the impact on supply. It is at least three and more likely five years between an investor making a final investment decision (FID) and an oil project producing oil. Unless many billions of dollars are spent in the short term, the world is facing the prospect of a significant shortage of oil in the early years of the next decade. Premier Oil (LSE:PMO), a UK oil producer once owned by the International Fund, is expected to bring its large Catcher project on stream later this year. The oil was discovered in 2010, the project was approved back in December 2013 and will finally add 60,000 barrels of oil a day to global production by the middle of 2018. US shale oil has proven adept at responding to price signals within months, but for the remaining 90% of global supply, adjustments take time. This lagged response works both ways, of course. The number of FIDs in the past three years has been lower than at any point since the 1940s. Among the oil majors, the rate at which they are replacing the reserves that they are extracting has fallen to 20%. There are still enough projects coming on stream to meet 2018 demand, but in 2019, 2020 and beyond, the lack of investment over the past few years is going to cause a serious shortage of supply. Norwegian bank Pareto estimates an annual shortfall of 7 million barrels per day by 2020, a gap that it expects to widen from there. The world clearly needs to add new supplies of oil over the coming few years. The remaining questions, then, are where that supply is going to come from and at what price it can be produced. If the US can add an extra 7 million barrels per day of production at a price of $50 per barrel, then the world doesn’t need offshore oil and the price doesn’t need to be higher. If that’s the case, our investment in Halliburton (NYSE:HAL) is going to be very fruitful. The oil services giant is heavily exposed to US onshore production and the amount of work and money required would need to soar. It is hard to see that scenario being plausible, however. Secondly, there simply isn’t enough of it to satisfy the world’s requirements. Oil production from US shale currently equates to less than 5 million barrels of oil per day out of total US production of slightly more than 9 million per day. It can (and will) grow in the coming years. The production shortfall mentioned above already assumes total US production increasing to 12 million barrels per day. That alone will require higher prices but it won’t be enough. Operational and financial leverage has made the long and protracted downturn particularly difficult for investors, including us. For the most part that leverage remains and there will still be restructurings and bankruptcies over the coming few years. It is not a space for large portfolio exposures. It is a place for some exposure, though. Development money clearly needs to be spent and oil prices need to be higher to encourage that expenditure. As painful as the past four years have been, now is not the time to be bailing out. 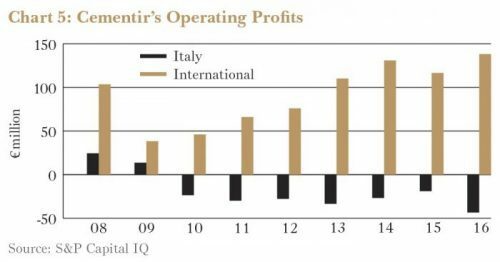 European cement maker Cementir (BIT:CEM), discussed in the June 2017 Quarterly Report, recently agreed to sell its loss- making Italian operations to Heidelberg (DB:HEI). While the €315m sale price is 40% lower than the balance sheet value of the assets, this is positive news. Since the financial crisis, the Italian company’s domestic sales have halved and profits turned into operating losses averaging €20m per year. Management has taken the opportunity to exit a highly competitive market at a price that factors in at least some improvement. The proceeds from the sale will be used to repay debt and its more attractive international operations are now the focus. Currently Cementir has a market capitalisation of €1.2bn. In 2018 its remaining cement businesses in Northern Europe, Turkey, Egypt, Malaysia and China should earn about €85m in net profits, implying a price to earnings ratio of about 13 times. This is good value considering the quality of Cementir’s assets, its strong balance sheet and a likely recovery in both Egypt and Turkey. Having risen 45% since purchase, Cementir makes up 4.3% of the Fund’s assets. In the first half of the 2017 calendar year, there were 90,302 electric vehicles sold in the US. That is approximately one fifth of the number of Ford F Series sales in the same period (429,860). Rising stockmarkets have made some of the Fund’s most successful historic hunting grounds less fertile. We’re not able to buy high quality smaller stocks in places like Italy below 12 times earnings any more (for now). The world is not devoid of smaller cap bargains. But those that remain tend to be riskier and we don’t want them dominating the portfolio. This section outlines three such stocks that have received scant mention in past quarterly reports, each representing positions of less than 2%. Hong Kong is a market of cheap stocks and plentiful landmines. We’ve been working hard to sharpen our ability to intuit the two, with the hope of investing more there over time. Small steps. King’s Flair (SEHK:6822) has been a small investment in the portfolio for a few years. The company is a sourcing agent for kitchen and homewares products. It stands as a middleman between large US homewares brands and the third-party manufacturers in China that make wares for them. The middleman role is often vulnerable, but long customer relationships (sometimes going back more than 25 years) and the huge list of manufacturers involved (numbered in the hundreds) hints at the intractability of King’s Flair’s position. The stock trades at 6-7 times earnings. While the share price is down a little on the Fund’s average purchase price, the annual dividend of close to 10% is appreciated. The current share price is more than half backed by net cash sitting in the company’s bank account. Hopefluent (SEHK:733) is a residential real estate agency (gulp) in China (gulp). It is riskier than King’s Flair but the upside is also larger. The position is small for a reason. Its most important business is the primary agency segment. When a developer constructs a new property, the task of selling apartments can fall to an in-house team or can be outsourced to specialists like Hopefluent. The market is split roughly 50:50, but has been trending in the direction of specialists. Meanwhile, Hopefluent has been winning market share versus competitors, especially smaller ones. Most of the country’s largest developers are customers. The business’s home roots are in Guangzhou, where it has a 70% share of the outsourced sales market. But it’s been growing strongly in other major cities for 15 years and 65% of primary revenues now come from elsewhere in China. The company also has a meaningful, fast-growing secondary real estate business with more than 400 shopfronts. Culturally, Chinese prefer to buy new apartments but the secondary market will continue gaining in importance. Unlike the primary business, this is still very much focused on Guangzhou. Hopefluent also has property management and financial services arms. The company has enough cash to pay off all of its debt and cover more than half of the market capitalisation. Unadjusted for that cash, it trades at 7 times earnings and has been growing very rapidly but, of course, there are risks to that continuing. One market as wild as the Hong Kong stock exchange is the Alternative Investment Market (AIM) of the London Stock Exchange. The number of entities on this exchange that destroy wealth is astronomically high. We now make the case for one. Before the financial crisis, Dolphin Capital Investors (AIM:DCI) was created to put together a portfolio of land for the development of high-end, exclusive resorts in the Mediterranean (particularly Greece), Central America and the Caribbean. Managed by an external manager, it’s one of the more egregious examples of rapacious compensation for immense wealth destruction you’ll ever come across. Investors contributed more than €800m of capital into Dolphin. Today it is valued by the market at about €70m. More recently, a more shareholder-friendly board has reined in the manager and are working towards liquidating all assets by the end of 2019. We’ve been watching how that liquidation progresses. They’ve been selling properties at deep discounts to already written-down book values, but at prices high enough to more than justify today’s depressed share price. Anything can happen at this end of the market, but we think the stock is good for a double or more as it liquidates over the next few years. Annuity provider Just Group (LSE:JUST) reported an impressive first half result. Operating profit before tax rose 39% to ₤67m thanks to annuity sales growth of 19% to ₤742m and a significant rise in new business profit margin, to 8.9% from 5.0% in the same period last year. Management’s outlook suggests continuing strong margins in the second half. The company is making good progress towards a sustainable return on equity of at least 10% which is why the stock trades much closer to NTA today than when the Fund purchased it. Alphabet Inc. (NasdaqGS:GOOG) reported revenue growth of 21% but the shifting nature of Google’s core business noticeably impacted profitability. The ongoing growth in mobile web traffic led to larger than expected costs paid to hardware manufacturers like Apple (NasdaqGS:AAPL). The company also reported a €2.4bn fine from the European Commission which may be a harbinger of further penalties and restrictions. Operationally, things at Lloyds Banking Group (LSE:LLOY) have gone better than we envisaged when making an investment in 2014. The latest half showed underlying net profit before tax up 8% to ₤4.5bn, representing an underlying return (after tax) on tangible equity of 16.6%. But ‘underlying’ is the operative word. Further provisioning for PPI compensation and other ‘conduct related issues’ chewed up nearly ₤2bn of the underlying result. The non-underlying contribution has been consistently worse than our original expectation. The regulator’s hard deadline date for PPI claims, set for August 2019, should help. Traffic management hardware and software company Kapsch TrafficCom (WBAG:KTCG) announced an expectedly lacklustre result. Revenue rose 8% but underlying EBIT fell more than 15% based on the re-pricing of a highly profitable truck tolling operation in the Czech Republic and the strong Euro headwind. A contract win this month to install and manage a complex nation-wide road safety and traffic management system in Zambia, in joint venture with a local partner, suggests remaining upside. The second quarter saw a healthy bounce back for convenience store operator Murphy USA (NYSE:MUSA). Its profit on fuel sales more than doubled from the previous quarter and the merchandise business produced its second highest profit ever on a per store basis. The CEO cautioned against overt enthusiasm predicting the third quarter might stall due to unfavourable fuel market dynamics. Online lottery ticket seller Lotto24 (DB:LO24) announced a strong first half result. Billings (the gross value of lottery tickets bought through the platform) rose 33% to €113m. The company’s revenue margin rose to 11.5%, meaning revenue of €13.0m, up 41%. Lotto24 achieved its first ever net profit, of €0.6m, and profitability should grow rapidly from here. 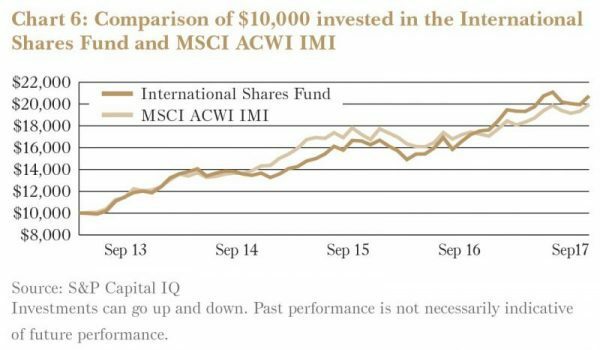 Rarely will reality run as closely to our initial investment thesis as it has with this stock. Fire truck manufacturer Rosenbauer (WBAG:ROS) disappointed long-suffering investors, with flat first half revenue translating into an 86% collapse in EBIT. Various one- off write downs are part of the explanation, poor sales in higher margin vehicles and a collapse in orders from Gulf States the rest. The second quarter was better than the first, and Q2 was its biggest quarter for new orders in several years. These orders should translate to a decent recovery in the second half. Unlisted real estate holding Winthrop Realty Liquidating Trust provided a progress update during the quarter and paid a $0.60 distribution. The Trust sold properties in Illinois and Oklahoma at prices in line with expectations. The distribution represents a modest return of capital on our investment but the real money will be made when Winthrop sells its Times Square property. No update was provided on that front. Flughafen Wien (WBAG:FLU) reported impressive first-half passenger growth of 9.6% and uninspiring revenue growth of 3.4%. Air Berlin went into insolvency in August. With that outcome expected months beforehand, management did a great job of filling slots with other airlines, often involving new route incentives (hence the revenue weakness). Air Berlin and subsidiary Niki represented more than 15% of traffic at Vienna Airport in 2016, and just half that in the latest result. 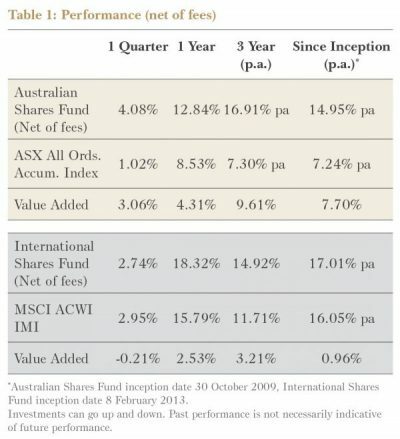 Selling some strong contributors over the past quarter has left the Fund with higher cash levels. There are a few opportunities on the radar, but a buoyant market makes reinvesting cash harder. 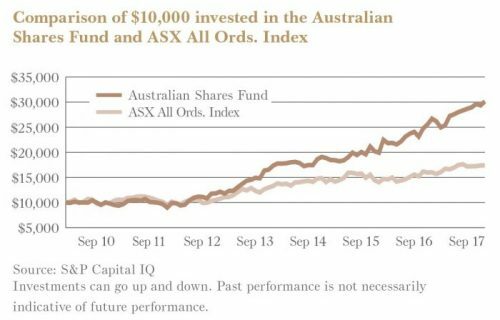 The past few months have seen cash levels in the Australian Shares Fund creep up to 37%. This has not been a macro call. Some of the better performers of the past few years have been sold. Other positions also required a rethink as circumstances changed. With limited distress in the market at the moment, putting that cash to work will take some time. 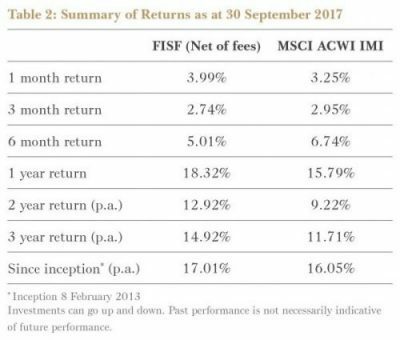 Many of the stocks that have been fuelling the Fund’s performance over the past three-plus years have delivered on or exceeded expectations. Some are now trading higher than our most optimistic initial assessment of value. Despite some updated thinking along the way, these stocks are on the way out of the portfolio. Take Service Stream (SSM). The network services provider has come a long way. In August 2014, the business reported just $17m in earnings before interest, tax, depreciation and amortisation (EBITDA) and had just raised $19m to stave off the banks. On the day it released its results, the company had a market capitalisation of only $80m. Today, after delivering $48.4m of EBITDA in the most recent financial year, it is valued at more than half a billion dollars. Expectations are much loftier now than they used to be. Investors are expecting growth to continue well into the future, despite the looming likelihood of peak activations on the nbn, an important source of growth for the company. Now trading on a price to earnings multiple of 16 times, Service Stream’s valuation is beginning to factor in plenty of certainty at an uncertain time. For engineering and environmental services business Cardno (CDD), which was only added to the portfolio mid last year, expectations have also heated up. Close to home the business is performing well and more work will come from a flood of infrastructure projects on the east coast of Australia over the next few years. But the Americas division is yet to turn. A forecast of $55m to $60m of EBITDA for the current year shows management has some confidence in margins improving. With the share price rising sharply in the past year most, if not all, of the upside here has already been priced in. Jumbo Interactive (JIN) is in the same camp. The online reseller of lottery tickets saw fewer major jackpots this year and still turned in a reasonable $7.6m net profit from its ongoing Australian operations. A special fully franked dividend of $0.15 per share in July and the promise of an 85% future payout ratio highlighted Jumbo’s capital light business model. However, as its ticket supplier Tatts Group (TTS) spent to improve its own offering, Jumbo has lost online market share. As we wrote in our June Quarterly Report, the margin of safety in Jumbo has largely evaporated. Then there are positions which have been reconsidered as circumstances changed. Reckon was one of these, described in detail later in this report. Remote power plant owner Pacific Energy (PEA) was another. Growth in this business is dependent on new and expanding power requirements, mostly from gold mines. The more generators deployed, the more the business earns. Growth, then, requires capital investment. Pressure from larger and better financed competitors has increased and the business has been missing out on new contracts. Pacific Energy is trading at over 1.4 times its book value and over 1.7 times its tangible book value. Given the likelihood of lower returns on capital in future, the current valuation does not offer a sufficient margin of safety. The Fund has sold its stake in Pacific Energy. 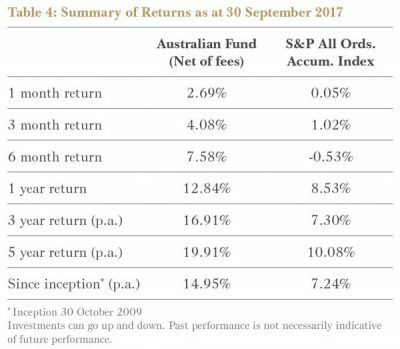 Many of the stocks that have been fuelling the fund's performance over the past three-plus years have delivered on or exceeded expectations. Some new stocks have already been added to the portfolio in recent months. Assuming the desired portfolio weightings can be achieved – sufficient liquidity is proving frustratingly difficult to come by – you will read about some of these in future quarterly reports. There are also plenty of interesting opportunities to keep an eye on. You should, however, expect the cash weighting to continue rising in the short term. That is an unfortunate consequence of the excellent performance over the past few years. It is going to require patience (from you and us) to put that money to work. As mentioned previously, not all sales have been the result of investment cases coming to fruition. The Fund’s second largest holding, Reckon, was sold in late July. And it wasn’t thanks to good news. First, the spin-off of Reckon’s document management business has eroded value. Now called GetBusy (AIM:GETB), the business has been separated from the rest of Reckon. It started trading on London’s AIM exchange in August. 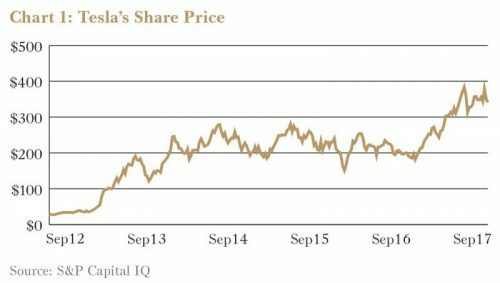 It is either difficult or impossible for Australian shareholders to own the shares. The best of some bad options was to sell Forager’s holdings into a bookbuild, where we received roughly $0.16 per Reckon share. This rapidly growing part of the business was pencilled in at $0.30-$0.40 per share in our valuation. Second, the management incentives here felt skewed. Reckon founder Greg Wilkinson, CEO Clive Rabie, and his son and COO Daniel Rabie underwrote a rights issue for GetBusy. Greg and Clive are directors and large shareholders, while Daniel became CEO of GetBusy. They had a clear incentive to underwrite the issue at the lowest price possible and have ended up owning a larger percentage of GetBusy than they do of Reckon. One can’t help but wonder if Greg and Clive have laid the groundwork to move on from the Australian company. Third, while management were running around the UK drumming up interest in GetBusy, Reckon’s Australian business has been under assault. US giant Intuit (NasdaqGS:INTU) recently added its cloud-based Quickbooks product to an already competitive Australian market dominated by Xero (XRO) and MYOB (MYO). In a recent results update, Intuit claimed it already had more than 50,000 online subscribers in Australia, dwarfing Reckon’s 39,000 at the time. Reckon used to distribute Quickbooks in Australia. Its customers are familiar with the name and are surely the main target of Intuit’s marketing expenditure. Much of Reckon’s spend on this part of the business has been tagged as “new business initiatives” and excluded from underlying earnings. If they want to compete, the spend needs to be permanent. Finally, most importantly, we lost confidence in our valuation of the Practice Management division. This is the part of the business that we had been using to underpin the downside valuation of the entire Reckon business. The main product, APS, is core software for a significant percentage of Australian accounting firms, apparently including four of the top five. Unpicking this part of the business isn’t easy. Management change the divisional allocation of businesses every year. For the most part, these changes seem to have resulted in propping up the growth of Practice Management. Our unpicking suggests the APS part of the business – the piece worth a strategic premium – might represent little more than half the Practice Management division’s revenue. The rest, mostly law-firm billing software nQueue Billback, doesn’t deserve the same multiple as APS. None of this is terminal. Reckon’s current price compensates for a few sins. The customer base is valuable and those currently paying will likely hang around longer than most people think. Throw in a loss of confidence in management, though, and it adds up to a significant erosion of our margin of safety. Reckon will be navigating its many challenges without us on board. The last reporting season highlighted that many businesses are taking technology spend very seriously. Aside from the specific disappointments related to Reckon, a growing requirement to invest in technology was a general theme of the recent reporting season. You might not think a business focussed on providing labour to build and connect physical networks needs to spend much on technology. Yet Service Stream has been making investments in technology to drive efficiencies and improve client service. For the second year running the business spent $7m on systems and technology, almost 15% of its EBITDA. Service Stream claims its technology is one important reason its margins are so much higher than its competitors. Mainstream BPO (MAI), an administration provider for financial services companies, spent $2m mostly to help the business automate its workflow. It claims 43% of transactions were automated last year, up from 19% in the prior year. If the money is well spent, client service levels and efficiency will improve as automation increases. Less direct staff involvement means lower costs. Competitors which can’t or won’t make the same spend run the risk of being stuck with a higher cost base. And then there are the businesses which sell software. Like Reckon. While they should be beneficiaries of growing technology spend, they have problems of their own. Frantic change means they can be left behind as technology shifts. Domestic competitors can spring up quickly with fresh solutions. International businesses can enter the relatively small Australian market and bring their greater resources to bear. Take the example of Reckon’s small and medium enterprise accounting products. Accounting software has shifted online. Traditional local competition from MYOB continues. Xero has also claimed market share with its sleek online-only products. Then there are the global behemoths: Intuit and The Sage Group (LSE:SGE). Intuit, a former partner, spent $1bn on research and development last year. Meanwhile, Reckon spent a little over $22m, mostly to develop its own cloud product. It is likely too little, too late. GBST (GBT), a Fund investment which makes software for financial services clients, surprised the market in August by announcing that its products would need an additional $50m of “investment” over the next three years. Underinvesting in the product over the past few years meant that the code has become dated. Meanwhile, competitors did invest in their products. Radical changes were needed and investors have had to pay the price. In many cases, technology spend made by companies has been capitalised. Cash has been spent but has not immediately been recognised as an expense on the profit and loss statement. Instead, it is first recognised as an asset on the balance sheet and then expensed over time. Often company presentations will ignore this amortisation, referring only to EBITDA. Investors will have to pay closer attention to both current cash expenditure and future amortisation expenses. We also shouldn’t forget that many technology projects will end in failure, over time and over budget. And, with the increasing speed of technological progress, many will not last the three to five years they were originally designed for. More software assets will be written off from company balance sheets. Management will be tempted to make this seem “one-off” in nature. Valuation metrics will have to be reassessed too. A common valuation multiple, enterprise value to earnings before interest, taxation, depreciation and amortisation (EV/EBITDA) ignores those capitalised costs. Just looking at price to earnings ratios in a period of rising cash software spend will paint an overly rosy picture for as long as a company’s cash spend is higher than the amortisation. Across all industries, technology continues to become more important. The prize for getting it right will be significant, as will the costs of failing to keep up. 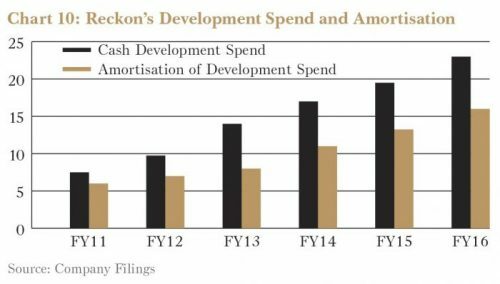 Mining contractor Macmahon (MAH) had an eventful year. A problematic contract lost the company $29m, a new CEO came on board in October, an opportunistic takeover by CIMIC was rebuked, and a new Indonesian contract resulted in a new top shareholder. For the year just gone the business delivered only $360m of revenue and lost $23m of shareholders’ money. The company is sticking by its guidance for a much brighter future. With the share price rocketing higher, it is going to need to deliver. Marketing and communications business Enero (EGG) is another long on promises and short on results. The company was buffeted by exposure to the UK over the year, with revenue slipping 12% to $100m and net profit falling 26% to $4.9m. Marketing Agencies Naked and BMF performed well in Australia, while UK-centric tech public relations business Hotwire was bolstered by an acquisition in the US. The net result is not enough. Enero’s valuable portfolio of businesses are still bearing the burden of a high corporate overhead and the company needs to grow to justify its existence. New Zealand media business NZME (NZM) produced a reasonable result for the first half of its financial year. While revenue fell 3%, net profit increased by 1%. Printed newspapers continued to suffer, with revenue falling 4%, while radio revenue fell 6% despite gaining market share. The contribution from online continued to power along, up 20%. The second half will see earnings pressured by the absence of the Lions tour, no America’s Cup and less cost reduction. Oil equipment supplier Matrix Composites and Engineering (MCE) had a disappointing 2017 financial year. Sales fell 65% to $33m and the company posted an operating loss of $4.4m. Part of its $14m net cash is funding the commercialisation of new products. While this could create new sources of revenue, an investment in Matrix remains a bet on a higher oil price and subsequent recovery in offshore drilling. It was a hard year for CTI Logistics (CLX) too. The company generates most of its revenue in Western Australia, which has seen a significant downturn in economic activity in recent years. Underlying net profit was only $4m compared to $10m at its peak in 2013. A mild recovery in its home state and cost savings related to a restructuring of the company’s leases should see profitability edge higher over the coming years. Finally, Brierty (BYL), operating in civil infrastructure and mining services, was the worst performer for the quarter, entering administration in September. This cost the Fund approximately 0.3%. The business has struggled to be profitable for some time and booked a net loss of $2.9m on revenue of $126.4m, down 41% from last year. It finished the financial year with $35m in debt and only $1.5m in book value.